Aerial Photographs Aberdeen Western Peripheral Route / AWPR Pictured is the connection of the A93 with the Southern Leg of the AWPR at Peterculter and Milltimber. Pictured on 06/10/2018 Picture by Darrell Benns. Supply chain costs for oil and gas firms in north-east Scotland are expected to drop as a result of the newly-opened Aberdeen bypass, according to transport bosses. 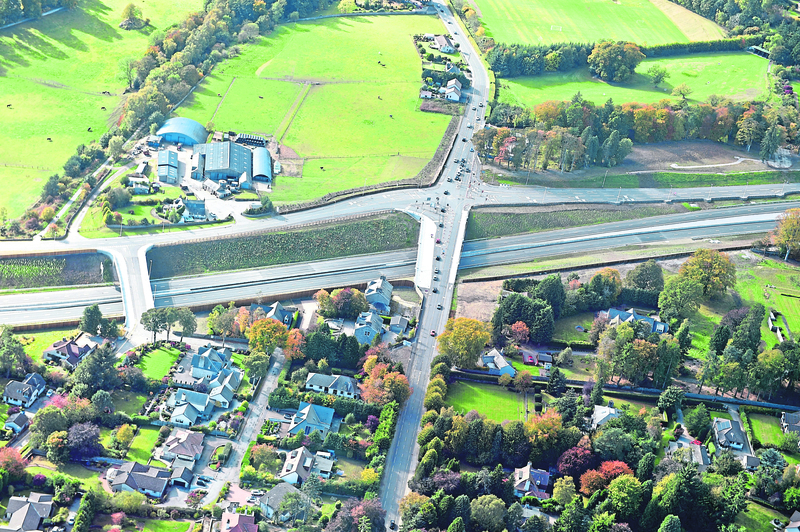 The majority of the £1billion Aberdeen Western Peripheral Route (AWPR) opened in December, cutting congestion at traffic blackspots in and around the city. Asco, which supports the North Sea oil and gas sector from its Peterhead base, expects costs for North Sea suppliers and operators to drop as a result of the development. The firm has seen journey times cut by up to 20 minutes on major routes, bringing savings which can then be passed on to customers, as well as improved quality of life for drivers. Transport and distribution manager Willie Smith also expects to see more firms bring their operations closer to the new route. He said: “Looking at the benefits to the industry overall, the AWPR will help make goods more accessible and the transporting of them more efficient, resulting in reduced supply chain costs for both suppliers and operators across the region. “We can also expect to see many companies make a strategic move, bringing their operations closer to the AWPR, where the improved route will have a direct and positive impact on their individual businesses. Areas like the south of the city have been among those to see reductions in congestion, along with approaches to the notorious Haudagain Roundabout on North Anderson Drive and Auchmill Road. Fellow logistics firm Peterson, which is based in Aberdeen, has also seen a dramatic reduction in journey times. Regional director Chris Coull said: “At Peterson we have already seen a benefit from the AWPR resulting in reduced traffic flows in central Aberdeen and avoiding bottlenecks in and around the harbour, Bridge of Dee and Altens areas. “An example of this is the journey from Montrose to Dyce that previously took our drivers 90 minutes is now done in 60 minutes due to avoiding traffic at the Bridge of Dee. “This dramatically improves our day-to-day operations and benefits our clients as well as the community as we can avoid travelling through residential areas such as Kincorth and reduce the number of vehicles passing school entrances. Transport body Nestrans has echoed those comments, adding that the bypass brings business benefits for the whole region in terms of improved access to the central belt. Director Derick Murray believes energy firms are among those that can expect to see the biggest improvements. He said: “It is really good news for business in general with that improved access to the central belt, which will be of huge benefit. “Better access from Peterhead to Aberdeen will also be of particular benefit to the energy logistics firms. “The bypass is not even fully open yet but we have seen significant reductions in traffic on Auchmill Road, Anderson Drive, the approach to Bridge of Dee and this has all been pretty much as we had hoped. “Journeys for the likes of Balmedie to Stonehaven are hugely reduced, 20 minutes is around the standard cut in time that we have been seeing.